Since shipping containers are made to be stacked, that’s how they’re usually arranged when reclaimed for architectural projects. It just makes sense, right? They fit together in a certain way. 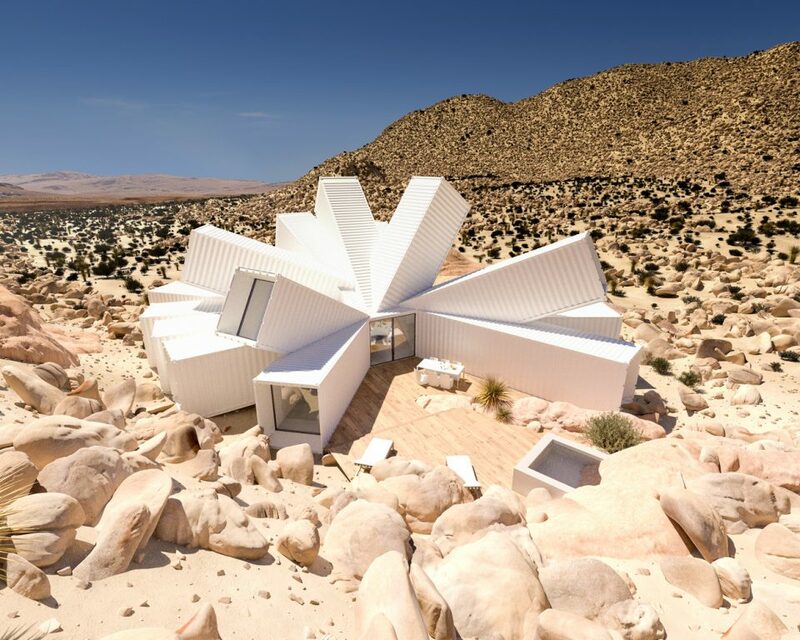 But architecture firm Whitaker Studio just smashed that convention in spectacular fashion with one of the most bonkers shipping container projects we’ve ever seen, and the results are as beautiful as they are unusual. 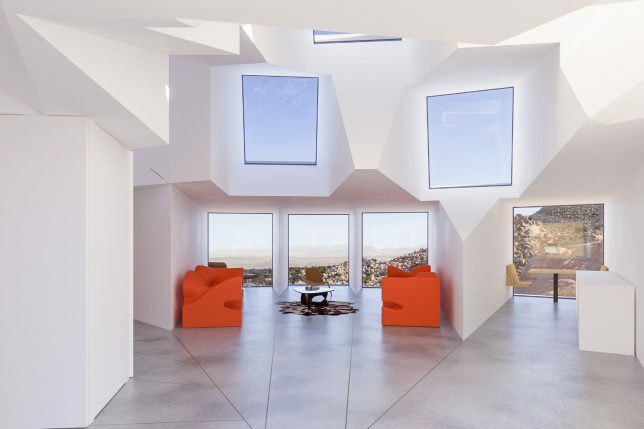 Rising from the rocky Joshua Tree desert in California like a rare flower, this all-white residence is laid out in a starburst shape with several shipping containers pivoted up toward the sky. 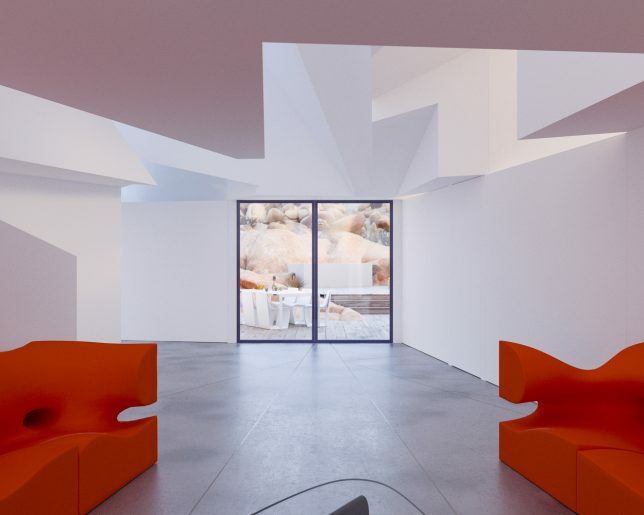 Each container is capped with glass and oriented to take advantage of a certain view, whether of the sky, the distant mountains, or the adjacent boulders. 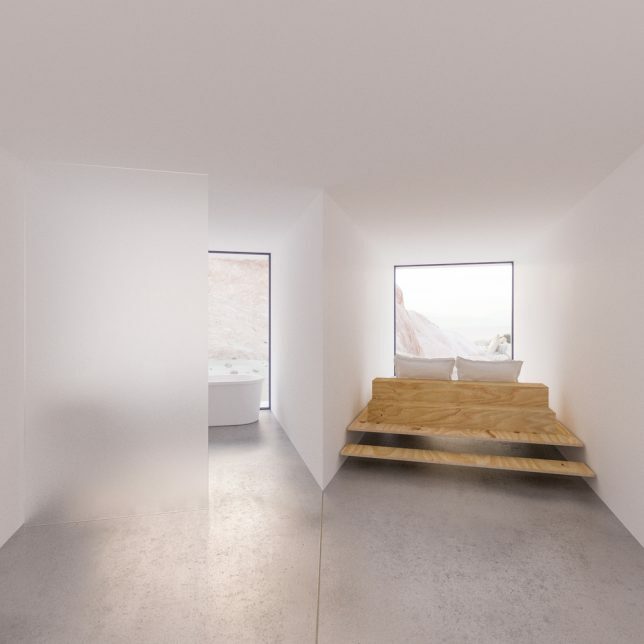 Each individual container either serves as a small room for the interior, or as a giant skylight bringing natural light into the core. Dining tables and beds can be spotted through the glass from outside, wedged into the narrow spaces. 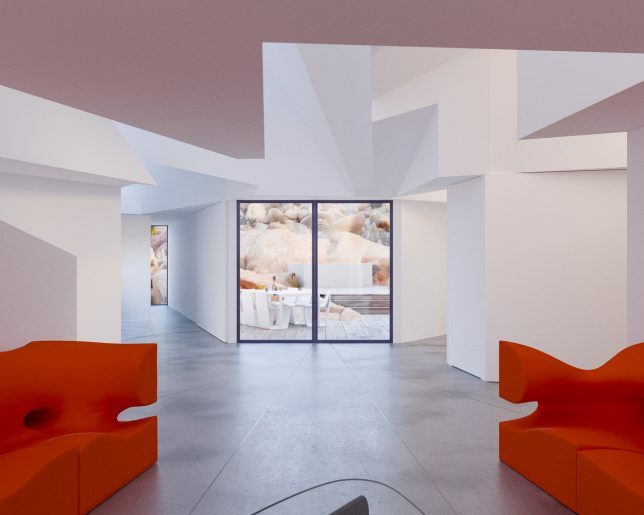 In some areas, several containers are combined with their walls removed to create larger rooms. The layout is hard to determine from the exterior, but once you see images of the 2,150-square-foot interior, it makes more sense. 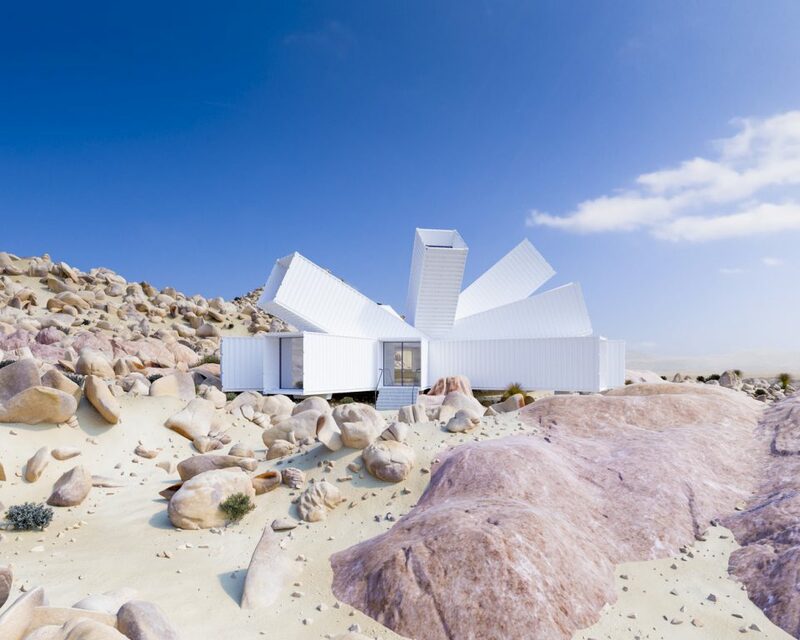 Though these renderings are pretty convincing, construction on the Joshua Tree residence is not set to start until 2018 on a 90-acre plot owned by a film producer. 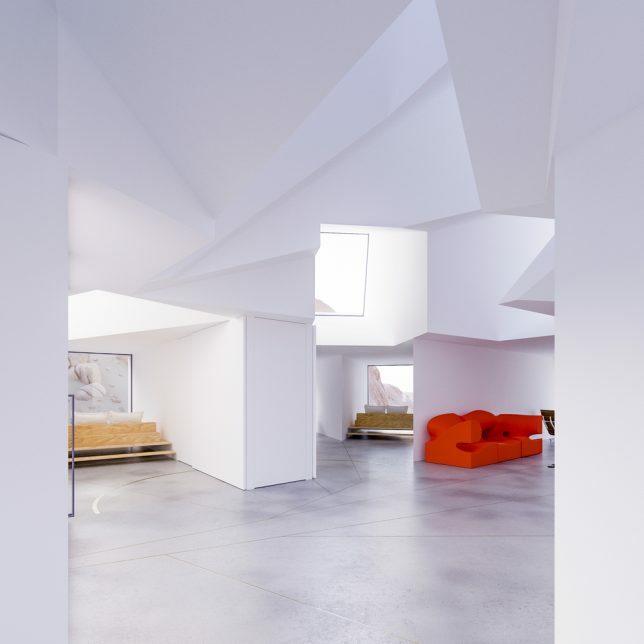 Architect and studio founder James Whitaker told ArchDaily that the client and his friends were visiting the plot of land, imagining what should be placed there, when someone pulled out their laptop and showed the group an image of a structure he’d designed several years prior, but that had never been built. The containers are arranged to fit within the topography of the site, angled wider in some areas to accommodate the hills and rocks, creating sheltered outdoor areas for decks and hot tubs. The site is set on a natural gully created by stormwater, so the containers are raised off the ground, allowing water to pass underneath.